Following steps will explain you how to use a film puller to retrieve a filmleader out of a 35 mm cartridge. Turn the film winding core 3 or 4 times in the direction of film winding prior to use of the film puller. 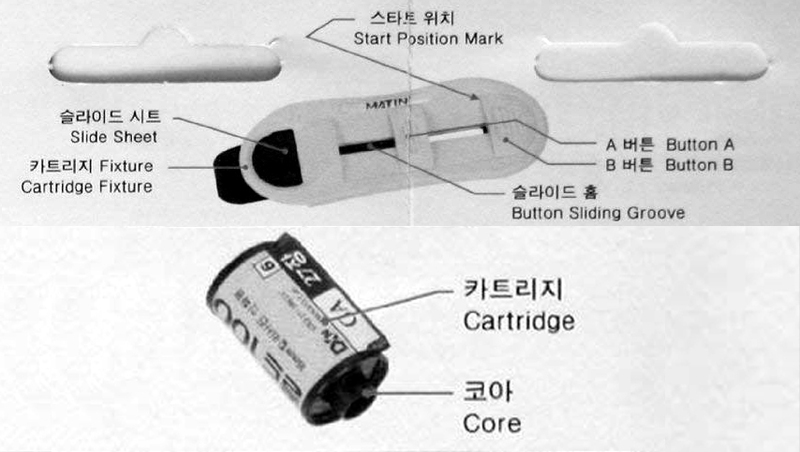 In case of 36-exposure film, the film fully occupies the cartridge. Therefore it is essentials to fully wind the film to make subsequent operation easier. Fix the cartridge holder by firmly holding with the left thumb and slide button A to the extreme left, check that button B is located at the extreme right of the button sliding groove. Lightly press the opposite side of the film winding core with the left forefinger so that it does not turn idly. Slowly turn the film winding core in the direction of film winding until a soft click is heard. Immediately a click is heard, cease turning. If the film winding core is turned too far, continue turning until another click is heard. In the case of 12-exposure film, turn the film winding core 2 or 3 times in the opposite direction of film winding after a click is heard. This procedure also applies to 10- and 16-exposure films. Release the left forefinger and the thumb from the film winding core and pull the filmpulleprout of the cartridge. The film leader is then extracted from the cartridge and held between the slide sheets.